Ample Films Ltd. - 96 min. 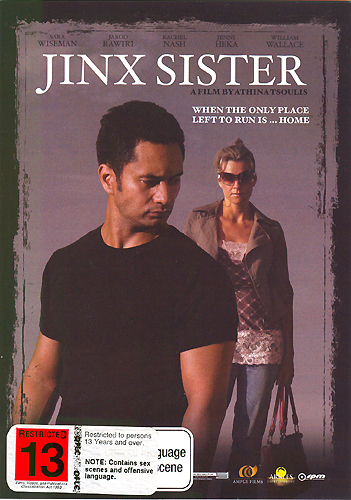 Cast: Sara Wiseman, Rachel Nash, Jarod Rawiri, William Wallace, Jenni Heka, Rawiri Paratene. Laura (Sara Wiseman) thinks she is a jinx. People who get close to her have a habit of dying, starting with her parents. She finds that running off to Los Angeles is not working. In fact, given her alcoholism, she is probably worse off. After 10 years, she decides to return to Auckland and try to re-establish a relationship with her sister. Trying to deal with sibling rivalry, loss and a need for intimacy, she starts to find a way to a better future. Some very good acting, music, photography and production values, even though done with a low budget. Recommended. It is available R4 PAL from New Zealand retailers at about $30nz and from Australian suppliers for about $30au. It is presented 1.77:1, enhanced for 16x9, with 2.0 dolby digital English only. There are no subtitles. The only extra is the theatrical trailer. There are 18 scene selection segments of 5-6 minutes each. As of December 2013, there are secondary market sources such as ebay Australia selling it for about $20au or DaaVeeDee.com in the US, selling it for $20us. No soundtrack CD of this title at this time.